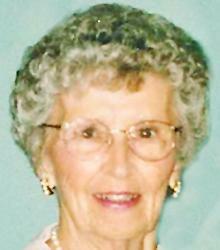 Dorothy Wannemacher, 96, of Toledo, Ohio passed away peacefully on Monday, January 12, 2015. She was born on March 8, 1918, to Dennis and Gertrude Donahue. She graduated from Notre Dame Academy in 1936. She married Francis Wannemacher in 1942 and that began a wonderful life together. They would have been married 73 years on January 24. Fran and Dorothy belonged to O.L.P.H. and St. Patrick’s of Heatherdowns parishes. Dorothy was a Eucharistic minister for 25 years at the latter parish. She was active at the church and attended daily Mass for many years until health issues forced that to cease. Dorothy also loved arts and crafts. She was active in several groups with many special friends- her “Therapy Group”. Fran and Dorothy also loved the game of Pinochle and the group of friends associated with this activity. But mainly Dorothy loved her family. She is survived by her husband, Francis; her 3 daughters, Marianne (Jim) Reece, Sherry (Rob) Gibson, and Linda (Will) Szymanski; 8 grandsons, Ken (Tracey) Reece, Matt Reece, Greg (Nicole) Reece, Ray (Sue) Micham, Kevin (Debbie) Micham, Steve Micham, Jason (Jamie) Szymanski and Andy (Jackie) Szymanski. She also had 21 great-grandchildren. Dorothy was preceded in death by her parents; her brother, Bob Donahue and sister, Denny Vikupitz. Friends may visit at the Coyle Funeral Home, 1770 S. Reynolds Rd. on Thursday, January 15 from 4:00-8:00 p.m., with a Scripture Service at 7:00. The funeral will begin in the mortuary on Friday, January 16 at 9:30 a.m. followed by a mass at 10 a.m. at St. Patrick’s of Heatherdowns Catholic Church. Burial will be at Resurrection cemetery. 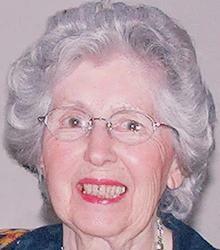 Jeanne C. Hoffmann, age 85, of Rossford, Ohio passed away on August 31, 2014, surrounded by her family. She was born on March 15, 1929, in Toledo to Henry and Anna (Gedert) Stuetzer. Jeanne was a 1947 graduate of Central Catholic High School in Toledo. She married Thomas Hoffmann in 1950, and he preceded her in death after 24 years of marriage. Jeanne had worked in retail sales for The Lion Store for many years and was a member of All Saints Catholic Church. She was a loving mother, grandmother and great-grandmother who will be dearly missed. Surviving are her children, Christine (David) Bowen, Michael (Susie) Hoffmann, Barbara Hoffmann and Margaret (Paul) Madden; grandchildren, Eric Wenger, Sara Bowen, Jeff (Veronica) Hoffmann and Nick Hoffmann. Also surviving are 6 great-grandchildren. Jeanne was preceded in death by her parents; husband, Thomas; 2 infant sons; brother, Robert Stuetzer, and sister, Betty Croniser. (News article) John McHugh, a former Lucas County recorder, treasurer, and Democratic Party chairman who capped a career in public life as a two-term mayor of Toledo, the last under the city-manager form of government, died Friday in the Elizabeth Scott Community in Springfield Township.He was 84. He had cancer, but his illness was brief, relatives said. After leaving office, he sold real estate for a time. Mr. McHugh served two two-year terms as mayor, from 1989 through 1993. He was succeeded by Carty Finkbeiner, who was elected to his first four-year term in 1993 under charter changes, endorsed by Mr. McHugh, that gave executive authority to the mayor and expanded the size of city council, with members elected by district and at-large. Mr. Finkbeiner said Mr. McHugh worked with Gene Cook, a longtime council member, to continue efforts for downtown revitalization begun in the 1970s by Edwin Dodd of Owens-Illinois Inc., Paul Block, the late co-publisher of The Blade, and the late Mayor Harry Kessler. “John sustained the development of downtown,” Mr. Finkbeiner said. Toledo Mayor D. Michael Collins was a Toledo police officer and president of the Toledo Police Patrolman’s Association when Mr. McHugh was mayor. For decades, Toledo had a city manager-council form of government. He liked an even keel – and a good laugh, said Sandy Isenberg, a former Lucas County commissioner, who said she was given her “first real job” in the county recorder’s office when Mr. McHugh led it. As he left office Mr. McHugh touted many achievements, four typewritten pages’ worth, despite the economy and the limits of his office. Among them were a seven-year deal with Chrysler Corp. to keep Jeep in Toledo; efforts with the Toledo-Lucas County Port Authority to develop an air-cargo hub at city-owned Toledo Express Airport, and creation of joint-economic development tax districts with Rossford and Perrysburg. Mr. McHugh oversaw the first stages of the former Portside Festival Marketplace becoming a branch of a Columbus-based science museum. In an interview on the public affairs television program The Editors he also said that race relations had improved, as had regional cooperation. Peter Silverman, a Toledo councilman during Mr. McHugh’s tenure, said the mayor gave him good advice because he worried a lot. Jack Ford, another Democrat – and a successor, though under the strong-mayor system – recalled that as a member of council, he crossed swords with Mr. McHugh on several issues. Mr. McHugh was criticized early in his first term, mostly with humor, for renting formal wear to attend black-tie events. Mr. McHugh came to the mayor’s office by what the late Chase Clements, The Blade’s politics writer, called “a circuitous route”: jury assignment commissioner for Common Pleas Court from 1956 to 1971; county recorder from 1971-1979, and then county treasurer from 1979-1985, when he became chairman of the Lucas County Democratic Party. He resigned in 1989 to run for mayor. He defeated Republican incumbent Donna Owens in 1989 and Republican challenger Paula Pennypacker in 1991. He ran unsuccessfully for city council in 1959 and for sheriff in 1968. Former Lucas County Commissioner James Holzemer said he and his wife, Janice, had dinner with Mr. McHugh and his wife, Connie, almost every Friday night for the last 15 years. He said the former mayor continued to be active in Democratic politics but never contemplated a return to office. “He was one of a kind. He was a genuine character. He would talk to anyone at any place, any time,” Mr. Holzemer said. He said Mr. McHugh was a good administrator who managed offices well. As Democratic Party chairman, Mr. McHugh aimed to bridge factions in the party between what was popularly referred to as the A Team and the Court House Gang, or B Team. “John wanted to bring people together and develop more by consensus,” Mr. Beazley said. Mr. McHugh was born Oct. 1, 1930. His mother, Catherine, grew up poor in Ireland and married his father, James, in 1928. Mr. McHugh once told The Blade that his first job was setting pins in the neighborhood bowling alley. A longtime South Toledo resident, Mr. McHugh later had an appliance store on Broadway, his son Jim said. 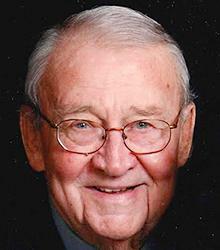 Mr. McHugh was a graduate of Central Catholic High School and attended the University of Toledo. He and his wife spent winters in Palm Beach Gardens, Fla., and he was a marshal at the PGA National Golf Resort there. He was preceded in death by daughters Cindy and Kelly, who died in childhood. He and Kathleen “Connie” Feak married Jan. 8, 1955. She survives as do sons, Tim and Jim McHugh; daughters, Bridget Cassady, Molly Branyan, and Kathleen Beach; sister, Margaret Gibney; brother, Tom McHugh; 11 grandchildren, and three great-grandchildren. Visitation is 2-5 p.m. Sunday and 3-8 p.m. Monday in Coyle Funeral Home. Services will be at 10:30 a.m. Tuesday in St. Joan of Arc Church. The family suggests tributes to the Old Newsboys Goodfellow Association, of which he was a former president, Hospice of Northwest Ohio, St. Joan of Arc Church, or Open Door Ministries. Blade staff writers Tom Troy and Lauren Lindstrom contributed to this report. Sharon S. (Siefke) Stukenborg, age 68, of Toledo, passed away on Wednesday, January 21, 2015 at Flower Hospital. She was born on April 3, 1946 in Toledo to Gerald and Hulda (Mitchell) Siefke. Sharon worked at the Sheraton Hotel for nearly 20 years as a Union Stewardess, she truly believed in helping others with her position. She will be remembered for her loving spirit and outgoing personality, often times she was the life of the party. Left to cherish her memory are her children, Curtis J. (Darlene) Stukenborg, Melissa (Phil) Paskvan and Michael (Nichole) Stukenborg; grandchildren, Austin, Justin, Abigail and Aubrey; siblings, Dale (Geri) Siefke and Joyce (Frank) Artrip; special friend, Leo and her cat, Izzy. In addition to her parents, she was preceded in death by her brother, Gary; sisters, Joan and Sandra. The family will receive guests on Saturday, January 31, 2015 from 11:00 a.m. – 3:00 p.m. at Newcomer Funeral Home, 4150 W. Laskey Rd. (419-473-0300). Funeral Services will begin in the funeral home at 3:00 p.m.
Danna Louise (Richardson) Klag passed away at Sunset House, Indian Road, Toledo, Ohio on Tuesday, December 23, 2014. Born to Franklin H. Richardson and Lucille Stanley Richardson in November of 1920, Danna, along with her late sister, Ruth Richardson Mostov, spent their youth traveling between New York City and San Francisco. Settling in Toledo, Ohio, Danna attended Scott High School and met Paul L. Klag, to whom she was married for sixty-five years until his passing in July, 2008. Surviving are daughters, Kristine (Charles) Schaub, Karlene Henderson and son, Scott (Elaine) Klag; also special grandchildren, Sarah (Jay) Carle, Melissa (Michael) Voeller, Peter (Laura) Schaub, Kayla Henderson, Hannah Henderson, Alanna Henderson, Graham Klag, Kendra Klag and great-granddaughters, Evelyn and Dinah Carle and Mabel and Marilla Voeller. Private service arrangements were made by Walker Funeral Home, Sylvania, Ohio. The family requests that any memorial contributions be made to Employee Fund of Sunset House, 4020 Indian Road, Toledo, Ohio 43606.